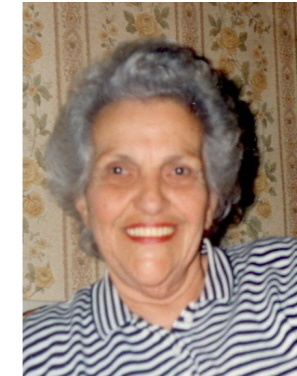 Alice (Germagian) Barsamian, 89, of Milford died March 27, 2012 in the Ballou Home for the Aged in Woonsocket RI. She was the wife of the late Varas Barsamian who died in 1987. She was born in Newton daughter of the late Harry and Rose (Ounjian) Germagian and lived in Milford and Franklin. She was a graduate of the Milford High School class of 1941. She was a wonderful mother, grandmother, great-grandmother and enjoyed cooking for her family. She is survived by four daughters Cynthia Paturzo of Bellingham, Pearl Barsamian of Bellingham, Charlotte Conlan of Franklin, Pamela Fior of Mendon, one brother Humphrey Germagian of TN, three sisters Serma Barsamian of Milford, Mania Bellanger of Milford, Margaret Ovian of AZ, seven grandchildren and nine great-grandchildren. The funeral will be private and the burial will be at the convenience of the family. Arrangements are under the direction of the Consigli-Ruggerio Funeral Home, 46 Water St. Milford Ma. Pearl, So sorry for your loss, you were a good daughter to your Mom. Our thoughts and prayers are with you and your family. Take care of yourself and I'll see you soon. Our thoughts are with All of you at this time of your loss. Your mother was a good woman and I will never forget her. Our deepest sympthy. Pearl, I am so sorry for your loss. You Mom was so lucky to have you watching over her care. She knew you where thier for her and I am really glad you were able to spend so much time with her. Rest in peace grammy. Love you so much. Cindy, I will always cherish the many memories of my aunt and Godmother. The fun and laughter that we shared made our life together so rich. I love you. Dear Cindy and Artie, I am so sorry for your loss,what I remember of your Mom was every time I met her she was always with you Cindy, shopping, lunches, you and her had a very special relationship, one only a Mother and Daughter can share. I was the oldest of all my sisters and shared a special bond with my Mom, too! Know she will always be with you and as time goes on you will see apart of your Mother in you, that is the gift of a "Mother" Love to you and your family!!!! We were so sorry to hear of your mother's passing. Our thoughts and prayers are with you. We will miss you dear Auntie. I have a memory of speaking with you on the phone and I'd ask "you what are you watching on TV?" you said,"I'm watching "my story". It was The Guiding Light. You've now followed The Guiding Light to be together with Uncle. Rest in peace. We love you. We will miss you dear Auntie. I have a memory of speaking with you on the phone and I'd ask you "what are you watching on TV?" you said,"I'm watching "my story". It was The Guiding Light. You've now followed The Guiding Light to be together with Uncle. Rest in peace. We love you. Pearl, Sorry to hear of your loss. Know that I am thinking of you during this time. Pearl, so sorry for your loss. You were always there for your mother and she knows that. May she rest in peace now. Pearl and Charlotte, Cindy and Pam, Please accept my sincerest sympathy for your loss. I know how much she meant to you and how your hearts must be breaking. But, maybe you will find comfort in knowing that now there is one more angel in heaven. May she rest in peace, with your Dad by her side, once again. To the Barsamian Family Was so sorry to read about the passing of your mother. I remember her well as a good friend of my parent's and her big smile. A beautiful women. May she rest in peace as she joins all of her friends and family who have gone before her. Cindy, Artie and family we are so sorry for your loss. May you find comfort and peace in your memories of her. Cindy the kids send you their love, thoughts and prayers. Love you.